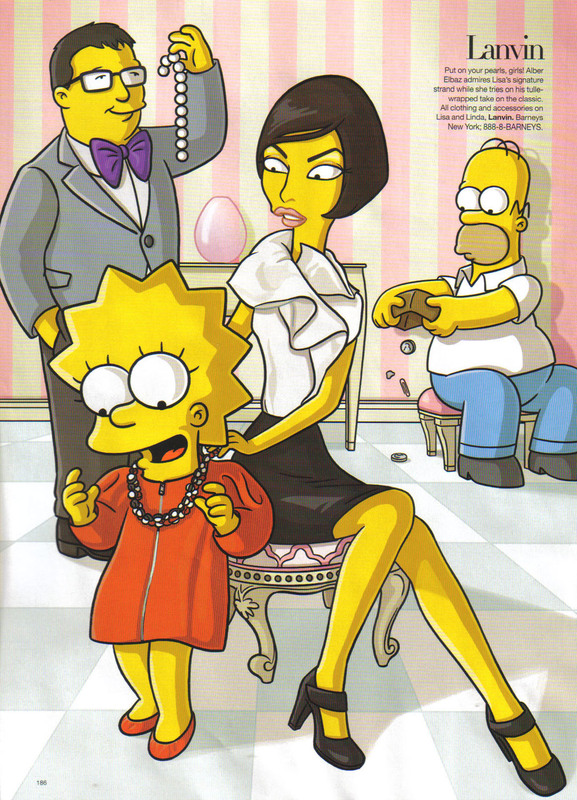 Harper’s Bazaar August 007 ~ “The Simpsons go to Paris with Linda Evangelista” “Models”: The Simpsons, Linda Evangelista, and various designers with Illustrations by Julius Preite. 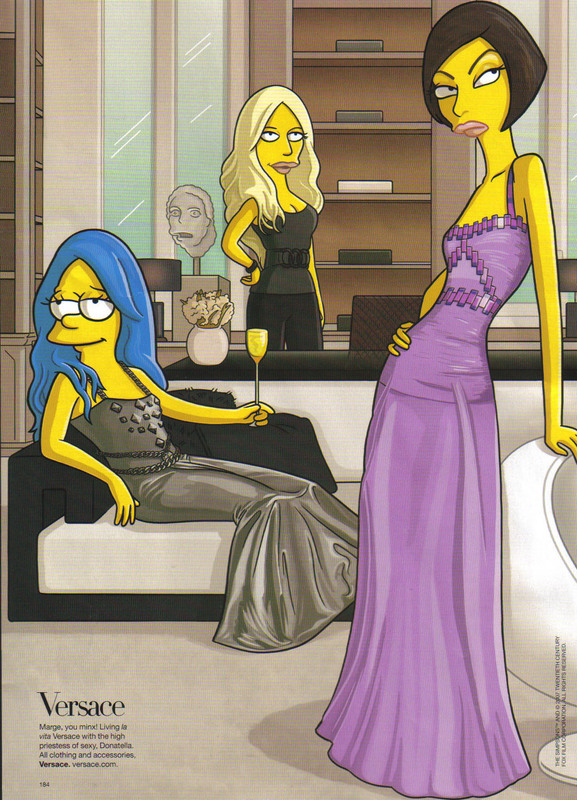 Marge lets down her hair for Versace. Lisa gives up her pearls for Alber Elbaz. 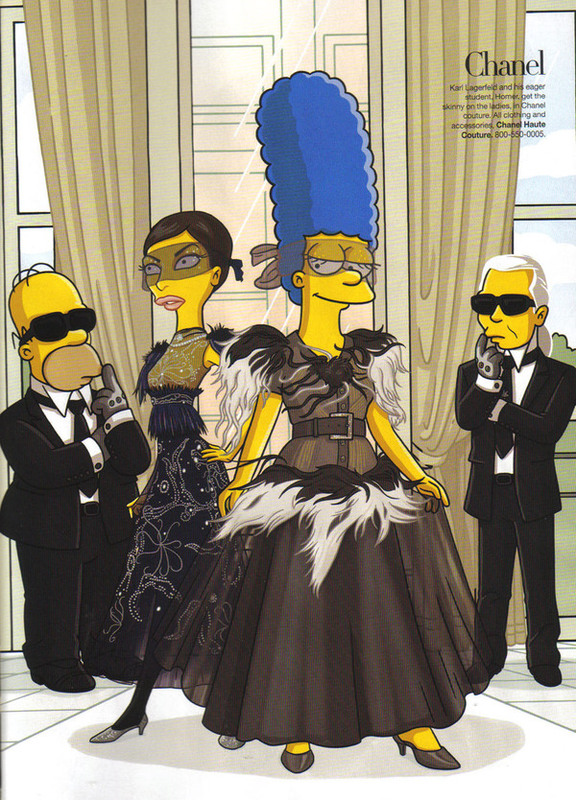 Homer dresses as Karl Lagerfeld. Selma & Patty in Viktor & Rolf. Maggie rides around in Jean Paul Gaultier’s Birkin Bag. Quite possibly the most incredible fashion spread i’ve seen (ok maybe tied with the Marie Antoinette Vogue spread?). To see the spread, see the pics below, and for some great animated versus reality pics of the dresses and designers, check out Oh No They Didn’t’s LJ. Wow. I am breathless… just go see more images already (and click any pic to see larger). I love Bart, he is so funny! I love this shoot! I bought this issue of Harper’s Bazaar just for it, someday I’ll have them framed lol… would definitely be a cool piece to have on the walls. loved them all. Love the simpsons and it’s just so neat to see them in this way. Wel my name is jacqueline and i´m brasilian. to mt prreiro memo!!! looooooooooooooooooooooooooooooooooool e preciso ter imginaçao, loool! LINDA I THINK YOU ARE A DREAM! 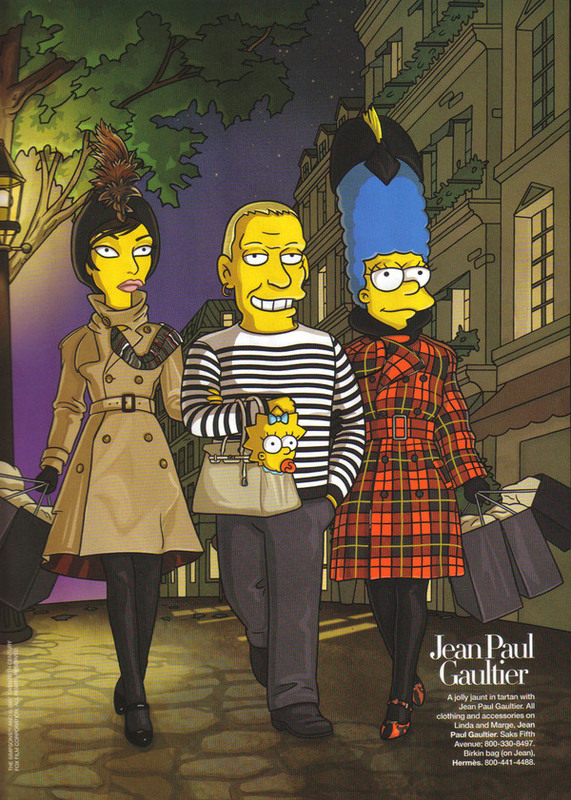 I love Marge in Jean Paul Gaultier, so classy! muito bom!!!!! muito bom, mesmo!!!! marge looks nice with glatt haar! i loved chanel…marge and homer(mista mafiaman) stole the spotlight right under evangelista n lagerfeld’s noses! NIQUE SA MERE LA PUTE LA FRANCE!!!!!! J’LA BAISERAI JUSQU’A CE QU’ELLE M’AIME!!!!!!!!!!! sisi les simpsons c’est trop de la bone sa c’est trop marrant si seulement dans le film ou les eries il serait habiller comme sa ses erais encore plsu drole etinteressant bn bref peut etre se jors dhabille quil y aurasdans le film je ne sait point car je ne les po encorevue!!!!! !merci a la personne qui ma fait voir sa!!!! fantastic! thank you for posting these!!! I think it´s great, mixing 2 fashion things un 1… love it! the illustrations are great! Finally fashion that feeds my inner dork! 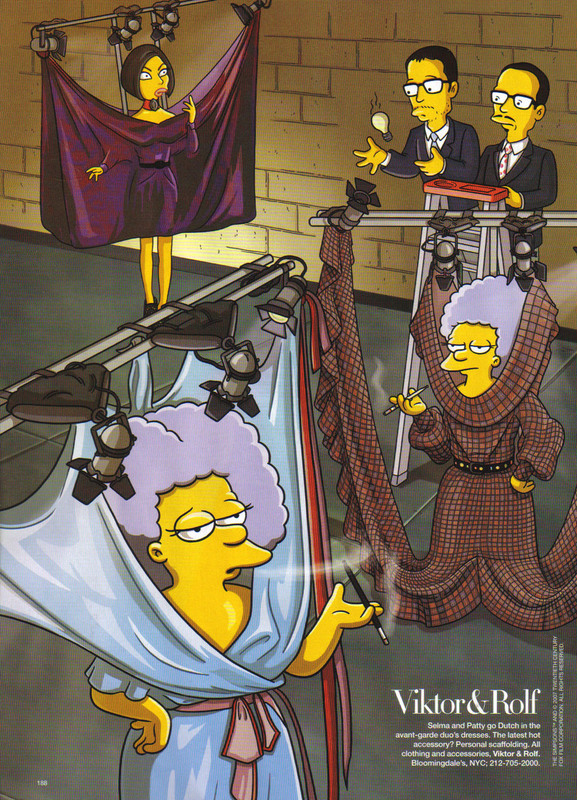 Marge has it goin’ on! super les frings merci !!!! les photos sont vraiment trop bien. 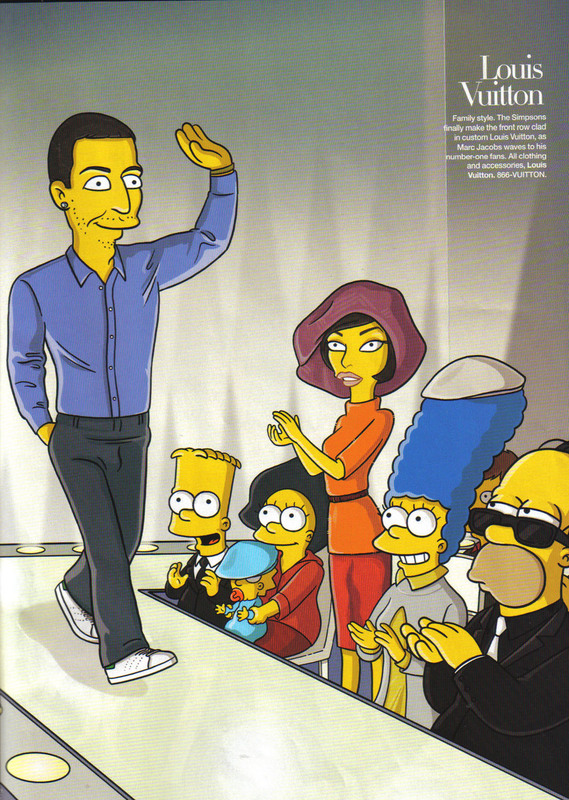 The best idea I’ve ever seen about Simpson, but I’m cooler than them and the whole world! Haha, this is great! The Simpsons are so classic. Thanks for sharing. Rho qu’ils sont beaux ! I’m from Canada. How do I obtain the August issue? I called our Chapters in St. Catharines and was informed that the Simpson’s in the Paris ateliers was not included in the issues they have? Love your spread! great eye candy…..so much fun! The Simpsons need to stop visiting other countries. I mean it’d be all right if this was done back in the old days when The Simpsons was actually good. But I can see this turning out as crap as everything that they’ve as of late. 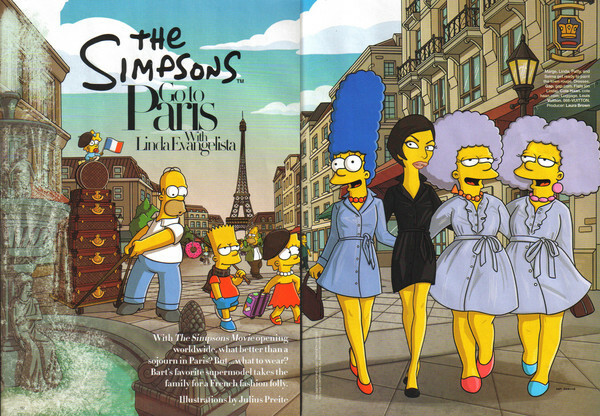 The Simpsons go stylish and Europe - wonderfull! The tine little french cap an Marges hair - yeah! Thanks for posting these! They are truly fantastic. lol i cant stop smiling about the post! !